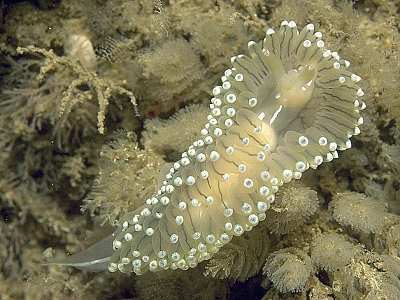 Description: A semi-transparent nudibranch with numerous swollen cerata, each with a thin dark thread of digestive gland running through the centre. The tips of the cerata are coloured with an iridescent bluish-white pigment, and similar pigment patches are found on the back, between the cerata and in the head region. The rhinophores have lamellae set at an angle, giving the appearance of spiral grooves. Between them is a cockscomb-like structure called a caruncle which is unique to Janolus species. A large species, growing to at least 75mm. 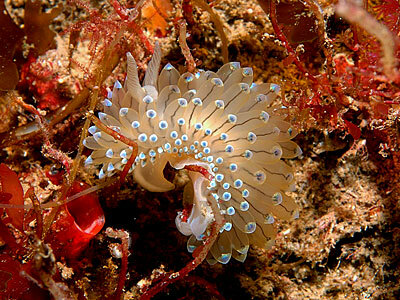 Habitat: Found in shallow sublittoral conditions, especially on sheltered rockfaces. 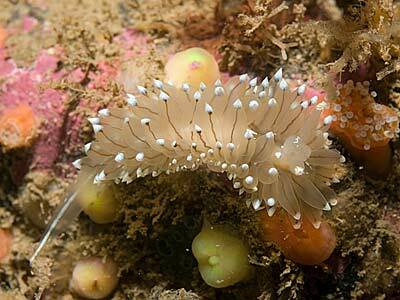 It feeds on erect Bryozoans, especially Bugula species. The spawn consists of a white or pale pink string wound in a wavy circle pattern, usually on the food. The eggs are in packets with clear patches between them, giving a beaded appearance to the spawn. Distribution: A common species in moderate depths around most of the British Isles. Recorded from Norway to the Mediterranean. Cerata extend across the front of the body. Picton, B.E. & Morrow, C.C. (2016). Janolus cristatus (delle Chiaje, 1841). [In] Encyclopedia of Marine Life of Britain and Ireland.